Why was the Must de Cartier men's line so unsuccessful? Must de Cartier Pour Homme1 was launched in 2000 and is already discontinued. Ditto with Must de Cartier Essence (2000), Must de Cartier Vert Anis (2001) and Must de Cartier Eau Genereuse (2003). Must de Cartier Pour Homme is a sleek, appealing fragrance; it begins with a delicious-smelling and opaque anise-tangerine accord; the citrus is not icy, fresh or "clear," but warm, cozy and generously spiced with anise, ginger and "olive leaf" (which may provide the momentary camphor-like aroma produced in Must de Cartier Pour Homme's early mid-development). Coriander, which has a citrus character itself, floats in the background and is a perfect lead-in to Must de Cartier Pour Homme's sweet tonka bean/vanilla base. I remember in Bangkok admiring the gold earrings of an elderly woman sitting in front of me on a water taxi. It took a 30-minute ride to realize they were gold earrings in the shape of chubby penises. 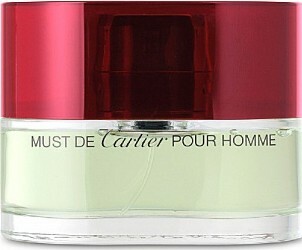 Must de Cartier pour Homme's hazy musk is similar: you don't notice it at first, but once you do, it's a bit shocking. As I wore this perfume over several days, I was impressed by its precisely blended formula and seamless progression; though spicy and rich smelling, the perfume wears lightly on skin. Must de Cartier Pour Homme is not a "cool character" but an approachable, earthy (if a bit dressy) personality. This fragrance is great for cold weather and when you want a scent you can smell all day but that won't intrude into others' space. Were the Must de Cartier men's perfumes too "adult" to appeal to a wide audience...too difficult?...too feminine? Who knows! But you can still buy this one online at reasonable prices (the prices seem to be getting less reasonable lately...so make a decision soon). 1. Perfumer: Nathalie Feisthaeuer; listed notes include green mandarin, bergamot, olive leaf, coriander, anise, vanilla, tonka bean, musk. Hi, Kevin – you note this one might have been perceived as too feminine. Do you think it would work for women? The earring analogy is wonderful! Noz, a woman could easily wear this. Alright, I need to try the perfume version of phallic earrings. Nice review, Kevin–and wonderful anecdote about the earrings. This is one of my favorite scents and really has a boardroom to bedroom versatility about it. I am also surprised that it never really took off but I wear it often and probably should stock up! Oviatt…yes, stock up; glad that a Must de Cartier PH fan commented! I think that bottle is gorgeous and I’m a big fan of an anise note and Cartier fragrances in general. This goes on the must-try list. Thanks for the review. Very vexed I missed this one. It sounds like something I’d be comfortable in. This is on Amazon UK for £90+ so unless I can find somewhere that sells samples I won’t be troubling myself with it. I wore it a couple of time but unfortunately it left a big cloudy powdery impression on and around me, like Chergui, Midnight in Paris, or Habanita. Reading your review, I think that I will need to give it a few more trial to see if my first impression was wrong. Platinum, well, I love me some Chergui and Habanita, so…. I own and love all of then, but I’m not often in the right mood for them. I love this one but have not worn it since 2000. It may be time to pick this one up again. I’ve been wanting to try this for a long time. I have the Essence version, it’s fantastic grapefruit ginger spice, very appealing. Was wondering if you’ve tried that one, Kevin.